Hi Friends! Happy Friday :) Anyone excited the weekend is here? I am! We're gonna look at some houses, go to the flea market and hopefully get some cleaning done... and my mom is in town for the weekend so I'm excited to see her. Anyway, today I am sharing some photos of my lip balm - I am always on the search for good lip balm - do you have any recommendations? I am definitely a lip balm person, not so much into gloss or lipstick. I think I liked gloss before but it was windy one time so my hair got all sticky from getting in my face and I quickly became an un-fan of it ;) What about you? lip balm or lipgloss? Hope you have a great weekend friends. ps: this post is not sponsored by any of these brands. I'm with you, a lip balm person all the way. My two favorites are Avalon Organics Vitamin C soothing lip balm, and Fresh sugar lip balm SPF 15. SOFT LIPS! It's my favorite. Though a lot of the best flavors/scents are only available through their website. My favorite in store flavor is raspberry, but I ordered some online and got a set with coconut, peach mango (OMG YUM), passion fruit, and two tints. The tints feel just like lip balm but with a hint of color. I am a fan of Dr. Pepper Lip Smackers. Not only does it smell good, but it give just the slightest hint of color. blistex lip medex is the best thing in the world. After a winter of trying chapsticks and balms to soothe my chapped lips, nothing has worked better! I just bought some of that EOS lip balm last night AND I LOVE IT! I, like you, am a lip balm fan! I had too many of those windy days. My favorite lip balm right now is Ultra Conditioning by Burt's Bees. I am going to have try out some of your favorites though! i LOVE all the lip balms from the gap. Once upon a time, I asked you to share you must-have pair of summer shoes, but you were on a shoe-band because you had been purchasing way too many so you chose to post about a lip balm that you had been wanting (it was that blue tube!). Hahaha, I loved the response so much! Thanks for sharing these! I have the world's DRYEST lips ever so this is a really nice lip balm report that is much needed for me! Happy weekend! Are y'all going to buy a house? When are we going to see a home tour!!! P.S. Vaseline rocks my lip world! I prefer balm, hands-down - I usually go for a red-pink lip stain with Crazy Rumors' Mystery balm on top. Recently I've started to like gloss in the guise of Barry M's toffee one (again with stain, I look sick without), but generally I don't like anything gloopy or sticky. I love Kiel's. Is that how you spell it? They are fabulous! Speaking of, I'm pretty sure I lost mine for the hundredth time. I usually use burt's bees, but recently have been using Josie Maran's lip treatment. it comes in a pretty pot and keeps my lips soft. have you tried making your own...very easy. martha stewart has a good recipe...my go to. 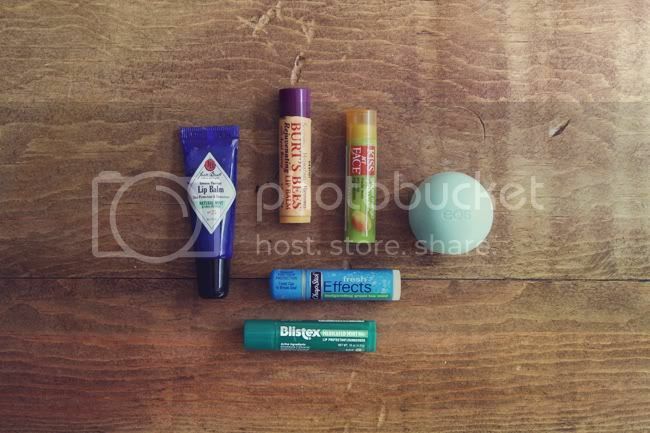 I love the LABELLO lip balms - hydro care is my favorite, but they also have very nice fruity lip balms all the time. And they are not too expensive, so you can easily afford different kinds at the same time. I have to admit I don't know if it is sold in the US. Jack Black is my favorite too!!! I'm a Burt's Bees girl too, but only the original flavor and stick...I've tried the others and don't like them as much. I also stumbled upon a set of 3 Blistex at Ollies of the dollar store? Anyway they are like repair, refresh and restore or something and I love them. Also love Janice Dickenson's lip balm for a little glimmer over lipstick and my all time favorite moisturizing treatment for my lips is to put on the Mary Kay overnight hand treatment (yes it is for hands...the pink stuff)...nothing works quite like it! I like Blistex Medex because my lips get so dry in the winter. Works good for me so far and lip stuff always gets dried up on my lips, so so far, so good! Happy Weekend! I know what you mean with the lip gloss! I'd say lip balm was the best, but I usually buy my own cute little hygienic boxes & put Shea Butter inside them! They're the best things for your lips! I use rosebud salve at home and Carmex is always in my purse. I am a self proclaimed ChapStick-a-holic. Cherry flavor only please. I keep little stashes of it everywhere!! It's crazy I know, but I just can't live without it. I always want to be a lip gloss/stick girl, but it takes to much work to re-apply (I don't tend to carry a compact with me). It's ironic that you didn't have much luck with the Burt's Bees Açai Berry, even though it sounded nice. I had the same issue with the Burt's Bees Mango Butter version. I saw it and thought, "I LOVE mango. This should be great!" It wasn't. Looks like I'll be sticking with the original. I'm addicted to lip balm and chapstick. 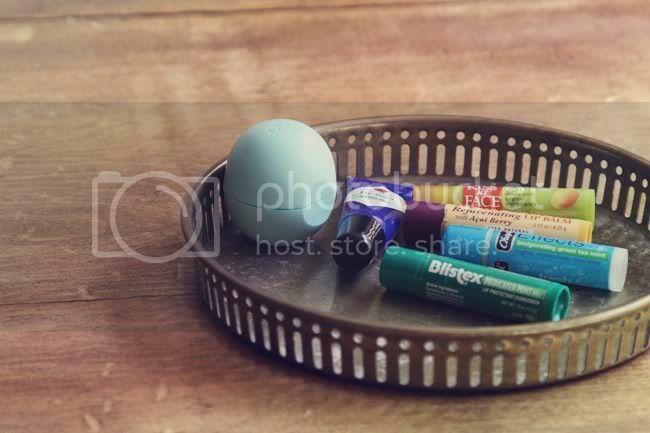 The egg shaped "Eos" is my total favorite right now! my all time fav is the eos mint!! too funny! I love lip balms too, my favorite is a local maker (http://www.hilltophoney.com/products.html). I just can't buy enough of them, it only has a hint of mint but it's so smooth! I second Softlips! It goes on so smoothly. I have a tube in my car, my purses, my jacket pocket, my desk at work, and so on! I use to love Jack Black and Burt's Bees, but now I'm with the Arbonne Lip Saver (SPF30). It's Vegan certified (botanical ingredients: Arnica, chamomile, linden extracts) and after seeing all the junk that goes into cosmetics, I'm happy to know my lips are safe. It's only $10 as well. I love their products. And Im always using lip balm! I love lipgloss and lip balm. They're essentials in cold weather. I don't really have a favourite as I use a lot of brands. One which stands out to me as having unique flavour was Funnel Cake lip balm by The Morbid The Merrier. Who knew there were so many lip balm fanatics. I used to love Blistex and then I loved Burt's Bees, but now,my favorite by miles is Nivea. They just came out with a mint one. The honey is nice too. Nivea bought this line out from a German company. Truly amazing. Look for it near the Nivea lotion. Most lip balm doesn't work for me. Except Dr. Hauschka's Lip Care Stick. It is a little more pricy, but it is all natural and holistic. I am totally a chapstick girl. My favorite (& it's probably the cheapest ever) is Chapstick medicated. It works so well & it's a bit minty! Agreed, the Kiss My Face cranberry/orange is amazing! We also like the strawberry Carmex in a stick. The strawberry tin from Anthro is in my purse, but more for the great packaging than the product. Totally worth the extra money you'll spend! I'm a bit embarrassed to admit that my lip balm collection & search for the perfect lip balm puts yours to shame ... I have lip balm tucked away everywhere ... car, desk, bedside, by the door, etc. My new favorite is Hurraw! http://hurrawbalm.com/ particularly the grapefruit & overnight. I'm obsessed with lip balm & I'm always trying out new ones. I have 3 favorites: C.O. Bigelow (goes on smooth & it's not sticky), Rosebud Salve (omg it's an amazing product - feels like it soothes my lips & keeps it super soft), & Softlips (mostly when I need something quick & it's small so it can fit anywhere, even in small pockets). 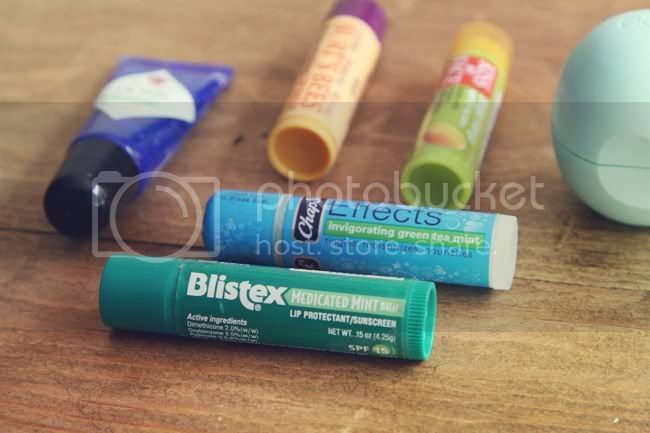 I do have & tried Blistex, Burt's Bees, Chapstick, & EOS in mint. All are ok but the three listed above are the best for me! Hope you get to try out new lip balms.. but if I had to pick one, I choose Rosebud Salve!!! I have that EOS lip balm, got it as a gift from a friend, and I love it! It is so easter eggish. You thought it was only OK? I am definitely a fan of the original Burt's Bees lip balm. It has that tingly feeling to it, and it isn't too slimy...that is why I don't like Chapstick brand. I think I am actually addicted to the Burt's Bees. I have one by my bed, in my coat pockets, in my purse, and anywhere else I can put one! I have thought of branching out to a different Burt's Bees [maybe the lip gloss stuff], but when buying I can't resist the original. I love both. :) When I wanna feel a little more attractive, gloss it is! i agree with the users who mentioned hurraw! lip balm. i would also recommend anything by LUSH, My Lip Stuff (mylipstuff.com), Orange Thyme (they are on etsy and sell via The Soapbox Company), and Good4You (also an etsy company) - those are all my all time favorite companies lip balm wise. My fav is "Love your Lips" by MyChell in pistachio coconut. Works wonders! Dior lip glow adds a touch of colour based on your lip chemistry and its AMAZING! Lip balm is a must for me too! I love, love, love the Badger lip balm in lavender and orange. They have lots of different flavors but that one is divine! I loke thi9s post! I cannot live without lip balm and I have one in almost all of my bags and in the car and at my desk at work. Lest I forget to have one on me! My favourite is medicated Chapstick with SPF. I am also a lip balm girl. I love the organic peppermint lip balm (whole foods brand). It feels super smooth and is made with organic ingredients. Also, the gloss from 100% Pure is not sticky. This is my new favorite cosmetics brand. I cannot go anywhere without my Burts Bees lip balm! That stuff is amazing! SO I tried out a Nivea kind (it's a light blue tube), which was recommended to me by my cousin, and I can't decide if I like it or not. I liked the mintiness of BB, so I think I'll have to try the minty Blistex one based on your post.